Right now, it seems kind of silly that the band Buckcherry, was caught trying to play the whole piracy angle. The single, Black Butterfly, had leaked onto BT sites but they also threw out a press release saying how they hate how pirates got to it. 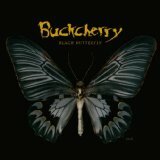 Amusingly, BT site Torrentfreak, traced it back to a band manager for Buckcherry. Obviously drumming up publicity. What Torrentfreak said is correct. 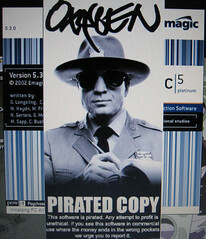 Pirated anything, be it merchandise or software or even media, has to come from somewhere. There is always an insider involved most likely since it doesn’t magically appear just as the money in the bank vaults don’t magically appear in your wallet. Another perspective however, is why they thought to blame pirates. I have some sort of feeling that they had felt (or perhaps the band manager) that pirated music is equated to wanted music. What they don’t seem to understand is that while that’s true somewhat, pretty much anything that isn’t locked down is probably traded in the warez scene just on different tiers. BT sites aren’t any different. Feels so juvenile to go… “ooooohh…BUSTED…” but just can’t help it. 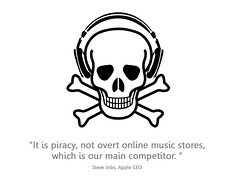 Fritz chip will prevent piracy? Atari’s founder, Nolan Bushnell, has made an absolute clause. And in the world of security, you never make absolute clauses. I can tell you that this statement is just asking for trouble. Most things don’t need prodding to get enthusiastic people get jump on and start trying to break it. In fact, there will be those people already. But stating any fact like this, is absolutely preposterous. Why? Even the SHA algorithm has been broken. Truecrypt? Broken. There are pretty much ways around every single type of algorithm unless you use some obscure and totally huge seed that can only be brute forced. And even so, there are many researchers that will attempt to find weaknesses in algorithms. But, let’s dig a bit deeper. The way Truecrypt was broken was because the password had to be stored in RAM for just a fraction of time. Yet, if you froze the RAM, that data could be extracted. Similarly, any sort of password at a low level has to be stored and decrypted somewhere at some point. This also has to be stored. Thus, there’s always a weakness to the strategies of password protection. This is really bad news for Beijing. I mean, with the 2008 Olympics coming up, they have been tightening the hatches and building and maintaining multiple billion dollar projects just to show the world that they’re on the up and coming. With the amount of money they’ve spent on the buildings and such, it’s an amazing thing that they had basically plagiarized a Flash game from The Pencil Farm. Apparently, some impatient web developer for the Olympics had downloaded the swf file, decompiled it and inserted the Olympic characters and such in place of the others, and replaced the words. What’s even more interesting is that the original author, did the same with the one from the Olympics, and found some files of his still intact within the swf. Obviously, the Internet community has turned up the heat on this issue. Should be interesting as to how Beijing responds to this since they don’t want any trouble to befall the Olympics and this could become pretty ugly with how fast the Internet mobilizes. Definitely something to pay attention to since The Pencil Farm should in fact get compensation for use of their game in the Beijing Olympics. And I’d imagine in an event as large as this, it should be pretty great compensation since it’s no different than if a company plagiarized an indie designers product and then displayed it as an television advertisement during the Super Bowl.